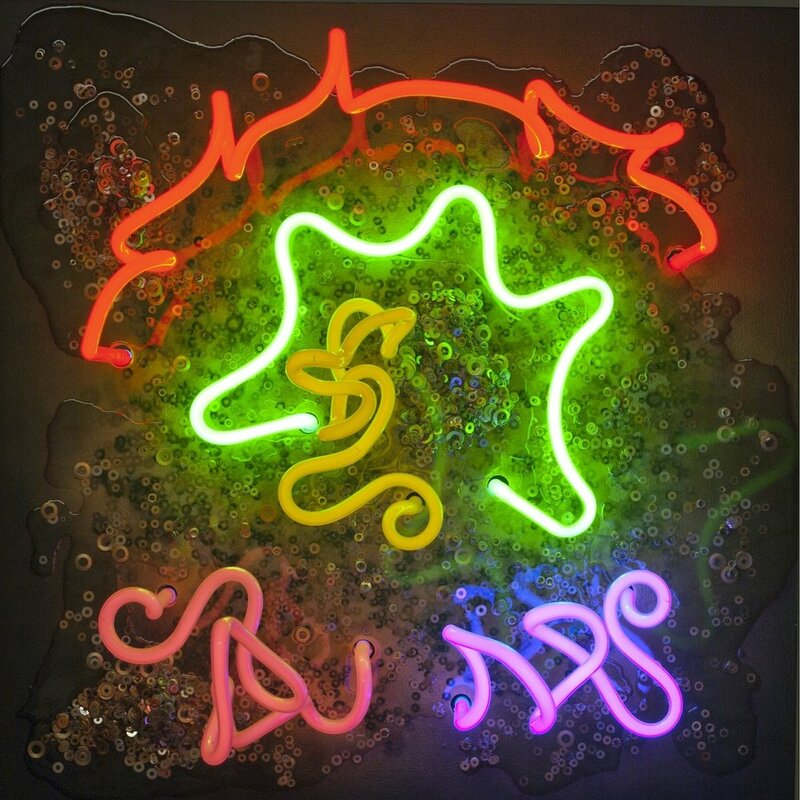 Linda Sue Price had never encountered a medium she didn’t get bored with, that is until she took a neon bending course at The Museum of Neon Art in Glendale in 2005. Prior to that, Linda had been working in video production for over thirty years, creating motion graphics. Linda’s process begins with free-form bending using clear glass, allowing the glass to react to the fires without any specific form in mind. As the glass heats, she loosely manipulates it into loops and curls in the air as opposed to bending it to a pre-drawn pattern on a table. “When I’m bending it’s like having a conversation with a really good friend. When it’s going well, everything slows and it’s amazing and you’re just one with the glass. But then there are days where it’s like you’re not communicating. You’re just going south. It’s very exhilarating when the conversation is going well,” she explains. Once a shape Linda is happy with emerges, she recreates the form in expensive glass, all the while considering what she hopes to express with the final form. Her The Mentors series for SHE BENDS: Women in Neon, are thank-yous to individuals who had a positive influence on her. Each wall-piece incorporates references to the person it’s titled for. Jesse, a thank you to Linda’s father, uses red and green tubing to represent his love for Chinese food. These wiry forms emerge from a background composed of washers, a shout-out to his proclivity for fixing things. 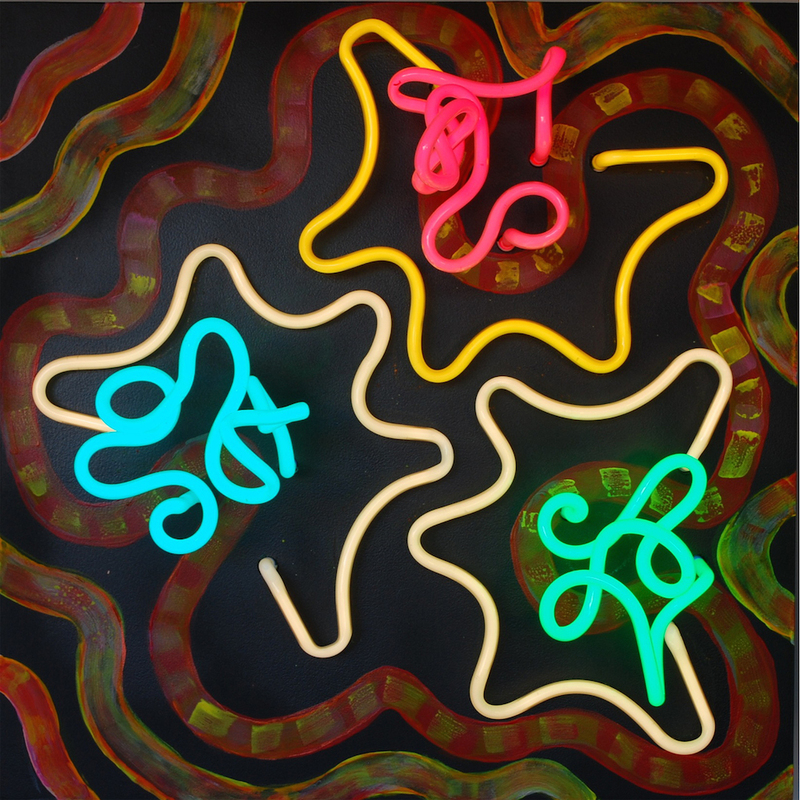 Near the bottom of the composition, are a pair of squiggles animated to flash back-and-forth, representing the conversations she and her father shared. Rose was the first art collector Linda encountered. She was a friend of her parents, middle-class folks who were appalled that someone would spend money on art and abstract at that. Amidst the confusion of her parents at the time, Linda remembers admiring Rose for being a unique figure among her parents’ circle of friends and recalls Rose’s collection as being her first exposure to art. Cynthia captures a feeling of liberation, the sentiment Linda felt when she met Cynthia, the first person she met who wasn’t actively trying to change her. 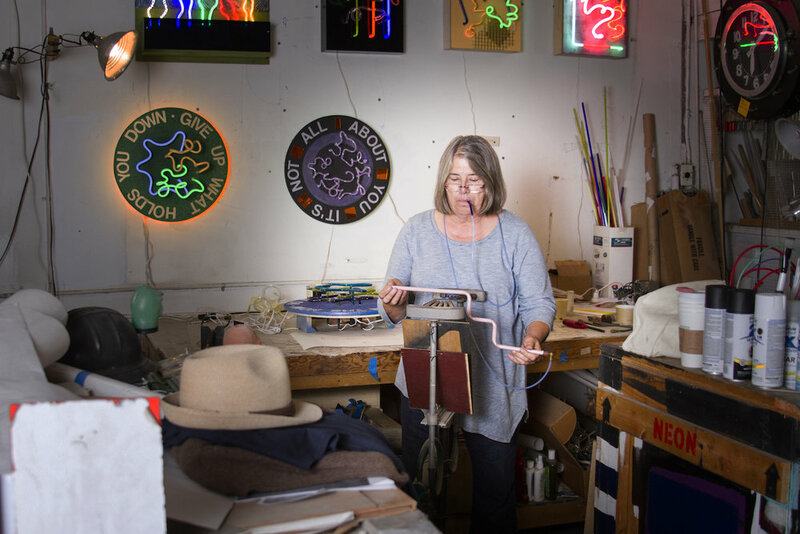 Linda now sits on the advisory board at The Museum of Neon Art and feels that there is a currently a revitalization of the medium. 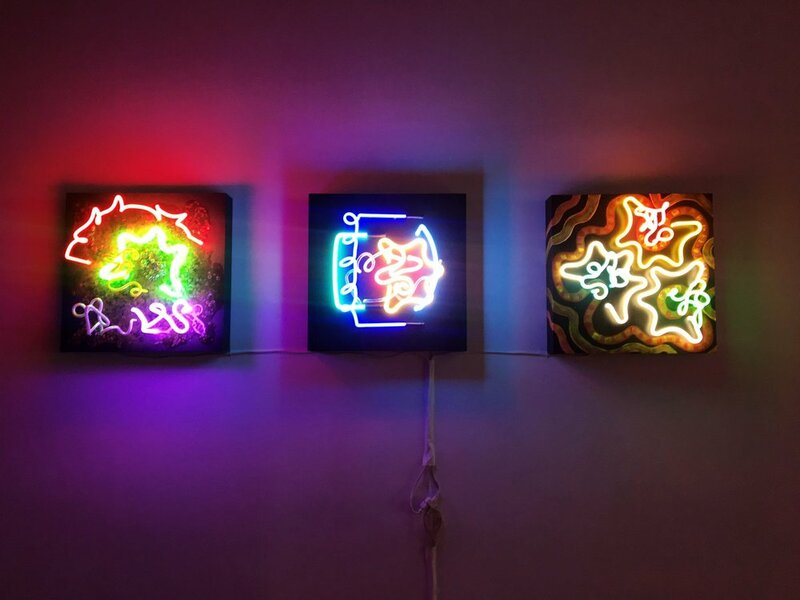 “Years ago, people wouldn’t accept neon into art shows because it wasn’t considered art. That’s changing now,” she adds. 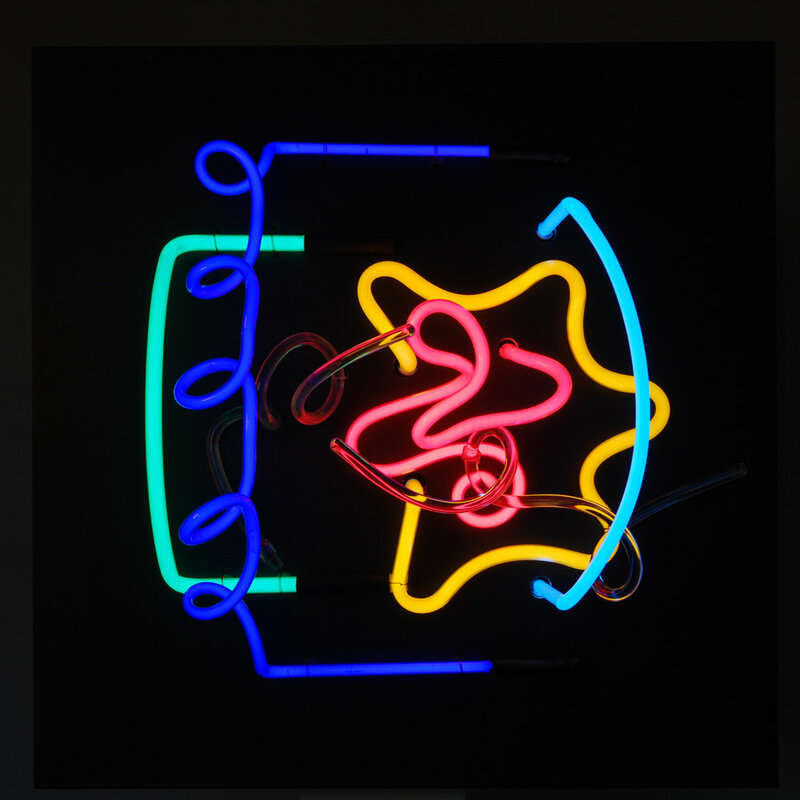 A selection of Linda Sue Price’s work is currently on view at The Midway Gallery as part of SHE BENDS: Women in Neon.